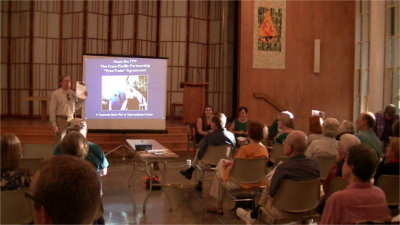 On the 14th of August, the Sierra Club, CCAN, Public Citizen, and other groups held another community forum on the ugly coming together ot the Trans-Pacific Partnership (TPP), fracking, and planned export of fracked gas. It really comes down to this: If the TPP passes, no jurisdiction in any signatory country will have the legal right to restrict ANY business practice unless they are willing to risk being sued in an international trubunal of corporate lawyers for every penny of potentional lost profits. In other words, if the TPP passes and MD bans fracking, any gas or oil company with an office in any other signatory country can demand to frack, then sue for the entire profits the fracking operation might have made. There would only be one way to stop gas exports if the TPP passes: to maintain ownership of all land on which gas export terminals could be built, refuse to sell, and refuse to build the terminals. For instance, if the Cove Point gas terminal remains in domestic hands and is blocked, no potential buyer of gas would be able to sue. Of course, if Cove Point were then sold to a buyer with a TPP signatory foreign subsidiary, the lawsuits would be back in play. For a MD fracking ban or continuation of the (soon to expire) fracking moratorium to have any chance under the TPP, it would have to be in place prior to ratification of the treaty. Even then MD could be on the hook for a lawsuit, depending on how strongly the treaty pushes rolling back existing regulations.